The Madison Youth Sailing Foundation is led by a team of volunteer parents dedicated to creating and growing a fun, safe, and competitive sailing program in the Madison area. We are always looking for enthusiastic leaders who share our passion for youth sailing. Contact us if you are interested in joining the MYSF board. Patrick Heaney is an active and enthusiastic sailor. He started sailing with his parents at 3 months old and has been on the water ever since. Patrick started in optis at 4 and has worked his way through the various ILYA classes having skippered optis, lasers, Xs, M-16, M-20s, Es and As. Patrick started teaching sailing school at age 10 and spent 8 years developing and growing the Fox Valley Sailing School. Patrick founded a high school sailing team and developing his collegiate program from regional program to an intersectional and national competitive team. Patrick continues to actively campaign an E scow, coach his children, and charter yachts for fun. I am excited to share the lifelong love of sailing culture and hang out on the water with anyone else who wants to have fun in the sun! Andy Muller grew up in Racine, Wisconsin and while an undergrad at UW, learned to sail on Lake Mendota at Hoofers. Soon thereafter he joined the UW Sailing Team, where he made life-long friends (including his wife) traveling the country to compete. He taught sailing for several years at Hoofers, Geneva Lake Sailing School, and at Madison Youth Sailing Foundation. His wife, a lifelong sailor, races C scows throughout the summer, and his children are just beginning in the program at MYSF. Andy’s top priority is to create a fun environment for kids to safely gain independence and learn and build skills through the art of sailing. Andy is excited to be a part of the Madison Youth Sailing Foundation. Emlie Veinot (maiden name, Barkow) grew up sailing Optimists, X-boats, and scows on Pine Lake, Wisconsin. She continued on to sail in College on the Women’s Team at Hobart & William Smith Colleges in New York while studying Psychology and Education. Starting in the Beginner Optimist Class at age 6, Emlie has been involved in Sailing Programs as a sailor, instructor, program director, and soon to be as a Parent. For the last 11 years, Emlie has been a Program Director to three (3) different yacht clubs across the country. At each club, she had success in developing both the quality and the quantity of each program. Managing sailing programs combines her two passions of teaching and sailing. Emlie’s top priority is to introduce as many youths and adults into the lifetime sport of sailing in a fun, educational, and safe way. Emlie is excited to be a part of the growing Madison Youth Sailing Foundation. ​Aaron Mann learned to love sailing racing X-boats, Lasers, 420s, and scows on Big Cedar Lake, Wisconsin and across the Midwest. 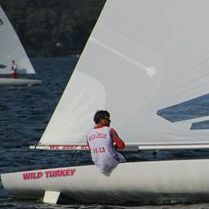 As a member of the UW Sailing Team for three years, he raced competitively all across the country, participating in two ICSA National Championships. After college, he raced C and MC Scows back on Big Cedar Lake. During a 4 year hiatus living in Minneapolis, Aaron was an active E Scow sailor on Lake Minnetonka. Now back in Madison, Aaron and his wife Liz (also an ILYA youth sailor and UW sailing team alumni) have started a family and are invested in growing a strong youth sailing program in the area.